I arrived at 1:30 to find a basement already abuzz with Friendly Exchangers busy transforming the space into FCE event shape. I can’t tell you how amazing it felt to see so many folks taking ownership of their event! Exchangers, you are amazing and always so ready to pitch in…can’t thank you enough as your help made our first Free Clothing Exchange of 2019 a very special one. 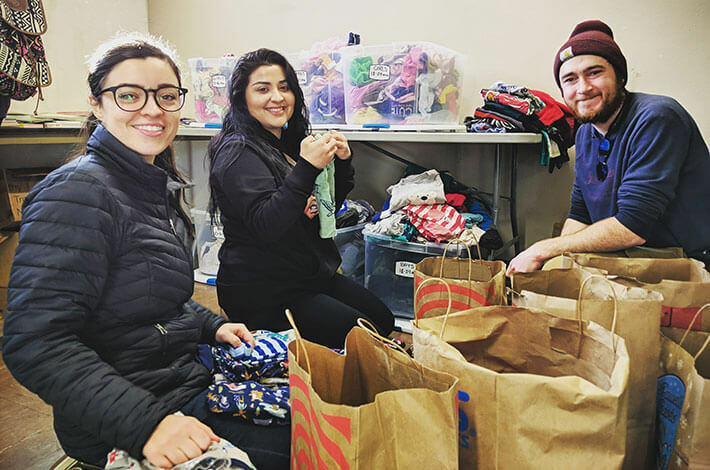 First of all, there were so many new and old faces that showed up ready to work, and there was a lot of work to be done this time around as Mosaic Church gifted the FCE a gobsmackingly-huge pile of great, new-to-us clothes. Thank you Mosaic friends! Those of you who worked the sorting table…I’m in awe of your clothes sorting stamina. You shifted, sorted, folded, pondered and hung thousands of clothing items. You rock! Many of these new items went out to new homes, but this influx of clothes and books will help keep our racks full through the March and May exchanges for sure. Speaking of new clothes, we saw a big batch of boys infant to toddler baby clothes come in, so if you’re in the market or soon to be in the market for little boy’s clothes stop by the upcoming March 10th exchange. A new feature at this month’s exchange were Wash & Dry tokens for Spin Laundry Lounge (sponsored by Spin and Mosaic Church). The goal with these Wash & Dry tokens is to help fellow exchangers who might have limited access to laundry services keep their clothes longer - to make what they have go further. If you didn’t get one of these tokens at the last exchange, and it would be a help to you, don’t hesitate to ask for one at the welcome desk during the March 10th event. The book exchange is going strong as well. More folks brought and engaged with the book area then I’ve seen in the past and, with a lot of new books for adults coming in, I saw as many grown ups as I did children checking out books. I personally took home An Anthology of Oregon Poetry, a Minimalist cookbook and a copy of Number The Stars for Baya and I to read together. A literary haul, if I don’t say so myself. We’d like to get our books more organized. If you have access to 2-3 rolling book racks that will fit on the elevator please let us know through the contact form on our website. Finally, a boy named Walter and his mom came to help out at the exchange. Before they left they told me that they came to study the event so that Walter and some of his student peers at Franklin might replicate it for their community. I think that’s awesome! There’s so much need for clothing resources, but even more than that there’s a need to build communities that go beyond the limits of our socio-economic clicks. If you can find something in common, say a preference for being stylishly un-naked when we leave the house, and mix in a time and a place then you can build a community. More power to you, Walter! If we can help you and your friends get set up just let us know. So many encouraging stories came out of the last event, but I’ll leave you with this bit of feedback from fleeo exchanger Aimee F. Best of luck, Aimee!